A three pointer is any shot taken from behind the three point arc and counts for 3 points. This shot can be a very useful weapon on offensive since it stretches the defense out towards the perimeter/wing. This, in turn, opens up the inside for you to drive or feed a teammate inside for an easy score. Think about it this way, if you’re a poor shooter from long range and the defender knows it, he’ll just play you loose and take away your driving opportunities. On the other hand, the farther you shoot from, the lesser the chance you have of making it. Often times, players fall in love with this shot and, as a result, become one-dimensional. The best way to utilize the triple is to add it to your COMPLETE arsenal, as a nice complement, not as the main component. Now, onto the actual shot. Shooting a three isn’t much different from shooting a shot from 15 feet, with the exception that it is much farther away. For some people, this is an easy shot, no effort whatsoever. However, for others, moving out past the arc usually stretches them past their comfort zone. If you've developed a technical smooth shooting stroke; you're halfway there already. The key mechanic is USING YOUR LEGS. Your legs will get the ball to the basket. Watch college basketball players or even the pros; when they shoot three pointers, they explode upwards into the shot. So if you feel like this shot is too difficult, focus on getting more lift and power from your legs. Believe it or not, there is strategy involved as to WHERE you shoot from behind the arc. 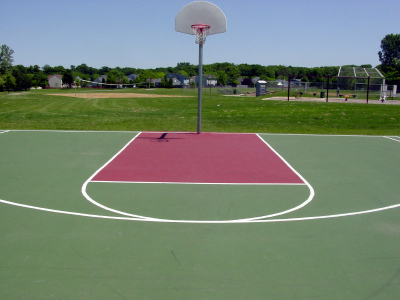 Many players have specific preferences as to where they like to shoot it from. For instance, for some players, shooting from the top of the key helps them aim the shot better since they’re looking directly at the basket from the front. Others might like to shoot from the “corner” or the side (right by the baseline). This is actually the SHORTEST three available. So practice this shot until you become a marksman with it; only then, will defenders respect your outside game.